receive with an FTA receiver. You will need a Satellite dish and a clear view of the Southern Sky. Encrypted / Scramble = Requires you to subscribe to the service provider. as often as Search by Country (lyngsat). In Canada & USA we're able to pick up satellites 61 Degrees west to 139 Degrees west. Looking for Professional /College Sports or News/Weather? Ku-Band Satellite (10.7GHz to 14.5GHz) requires at least 30 inches or bigger satellite dish. Most common size dish for Ku Band is 80cm to 90cm Dish. C-Band Satellite (3600 MHz to 7025MHz) requires a much bigger size dish. In the past you would only use BUD dishes (Big Ugly Dish) which range from 6ft to 10ft. We would recommend using a minimum 1.2Meter Dish for best results however some hobbyists are experimenting with 90CM Dish. digit frequency, then it's being broadcasted in Ku Band. The recommended dish size is general reference, it's better to go bigger than smaller for stronger signal. Free to Air Satellite offers plenty of Free Legal TV Channels with only 5 Steps to get started. 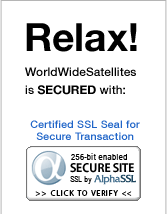 Local HDTV or Free IPTV, WorldWideSatellites.com has all the equipment you need to enjoy Free TV!